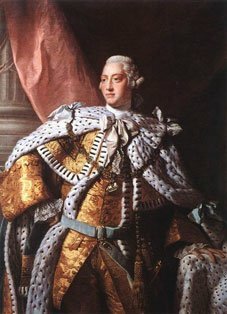 After his grandfather, George II's death on the 25th of October 1760, George III became King of Great Britain and King of Ireland. On the 1st of January 1801, the two countries were joined and he became King of the United Kingdom of Great Britain and Ireland. He remained King until his death on the 29th of January 1820 but for the last 10 years of his reign, the country was ruled by his elder son, the Prince Regent. We are pleased to offer a range of fine antique sterling silver from the George III Period. All of our George III silver can be purchased online, or from our shop in The London Silver Vaults. George III, the grandson of George II, was the third British monarch of the House of Hanover, but the first to be born in Britain and to use English as his first language. In stark contrast to the other Hanoverian Kings of Britain, George III took his position seriously and battled tirelessly with the many political issues of the era. He was also a family man, devoutly faithful to his wife, with whom he had 15 children - more than any other British Monarch. During his reign, some important political events occurred. Abroad, in the 'American Revolutionary War', Britain lost its American colonies, the United States was born and the 'Declaration Of Independence' was penned. At home, Britain and Ireland joined to create The United Kingdom of Great Britain and Ireland. Whilst the country's population doubled, its imports and exports quadrupled, the economy industrialised and Britain emerged as the principal power in Europe. Throughout the later part of his long reign, George III increasingly suffered from bouts of mental illness. For the last 10 years of his live he was considered insane and consigned to Windsor Castle, whilst, the duties of the King were preformed by his son the Prince Regent. George III silverware is diverse in style. The first years of his Kingship saw a continuation of the confident silver designs of the late George II period, but as trouble grew in America, the style of silver began to return to the plainer forms of the Queen Anne period, reaching its pinnacle of simplicity around 1790. By the turn of the century, the taste for more elaborate silverware was clearly returning and from 1810 to the end of George III's reign, the 'Regency Period', we find some of the most elaborate silverware ever produced in the British Isles.